Where do I use my Bargain Max voucher code? 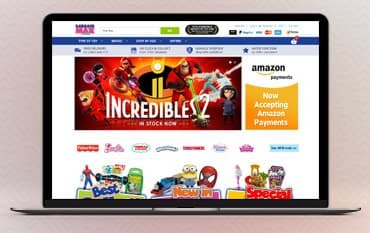 With five star reviews from over 1000 customers, you can rest assured that BargainMax is a top quality retailer of authentic toys and games from many renowned brands in the industry. You can find all kinds of toys in the BargainMax store including dolls, playsets, action toys, electronic toys, arts and crafts, games, cars, trains, planes, construction toys, outdoor toys, figures, baby and pre-school toys, kid’s homeware and collectors items, all of which are extremely affordable. All of these toys come from big brands like Thomas & Friends, Transformers, Shimmer and Shine, Disney Princess, Baby Alive, Playmobil, Nerf, Hush Baby World, My Little Pony, Paw Patrol, Jurassic World and Bing. Shop for all the toys and games available at BargainMax by your child’s age and find items for kids aged 0 months to 9+ years. You can also discover featured toys that BargainMax have recommended themselves or browse through the sale or warehouse deals section to save money on your big branded toys too. Electronic toys are a great way to both educate and entertain your children. No matter what age your child is, they’re sure to enjoy the magic of electronic toys, and with a wide selection of electronic toys, puzzles and games for boys and girls, you are sure to find something that your little one likes. Shop for robotics, musical toys, spy-kits, LED lights, handheld toys, electronic toy playsets, computer and app toys, preschool electronic toys and electronic animals and pets. All these toys come from top brands like Air Hogs, Animagic, Disney Frozen and Finger Fidget and some even have huge discounts of up to 50%. You can find a great selection of arts and crafts at BargainMax. This arts and craft section boasts fantastic items that can help your child express their creativity and imagination. These items include colouring books, drawing and colouring books, dough, clay, pencil cases, creating toys, science arts and crafts, sewing and jewellery sets, scribblers, electronic art sets and role play. All these products are extremely affordable and some even have huge discounts of up to 50% off. Discover arts and crafts for kids aged 18 months- 9 years from big brands like Avengers, Build a Bear, Bunches, Crayola and Disney Cars and keep your little one’s preoccupied and entertained with exciting art products that they’ll love. BargainMax is the UK’s number one online toy store that provides affordable toys and games for children of all ages. BargainMax only sells top branded products from popular brands like Lego, Moshi Monsters, Star Wars, Barbie, Hatchimals, LOL Surprise, Play-Doh, Monster High and Fisher Price. Shop online for toys from all these brands and use a Bargain Max discount code from us to save money on your order. You can also enjoy unbeatable delivery options, click and collect from over 1000 locations around the UK and great discounts in the offers section.